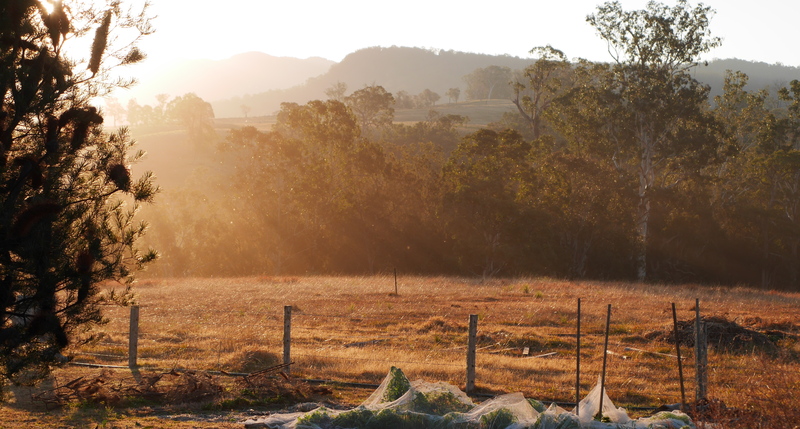 Stunning yellow paddocks fill the valley of Lindesay Creek. There’s running water in the creek, clear and blue. I dipped my hand and took a sip, it tasted good. Groups of stinging nettles ready for picking when I return with my gloves. The morning is alive with bird song… much celebration, there’s been rain. Rainbow Lorikeets hop along the ground foraging for food, the magnificent Magpie, his muscular body and brilliant black and white. The yellow beaked Noisy Miners flitting through the golden Candle Banksia, so generous with its giving. The Willy Wagtail with its high-pitched call. 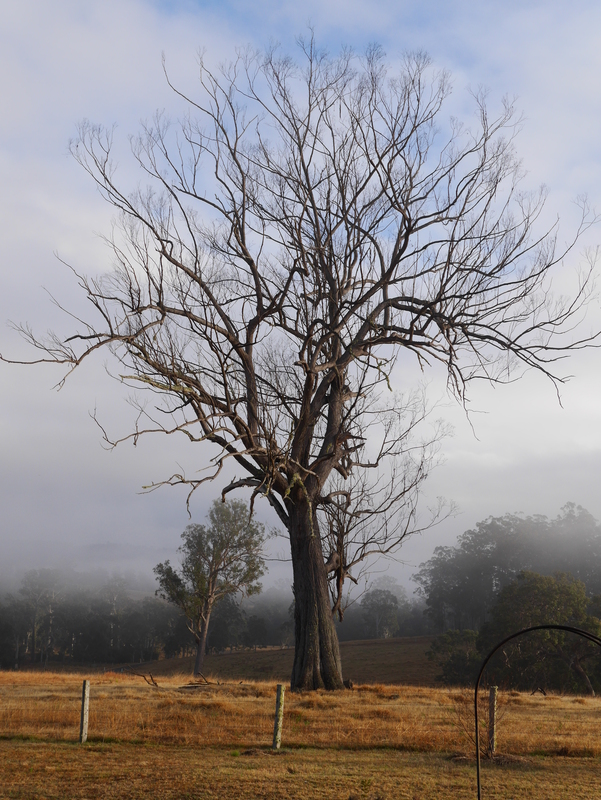 The kookaburra… well this is their home. 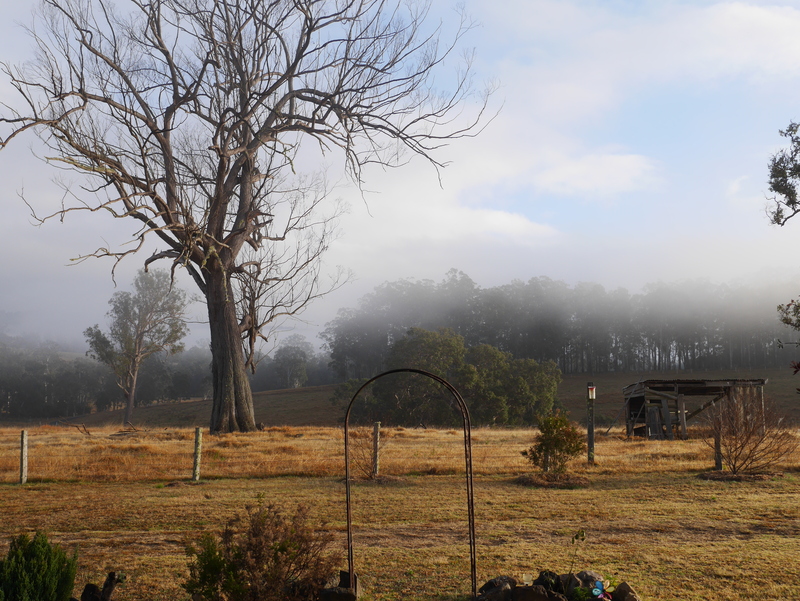 Morning Sun escaping from heavy mist turns paddocks into gold and reflects on smooth white trunks… a family of Ghost Gums, across the creek in the neighbouring property. The harmony of life so vividly present. It’s clear what is. I don’t suppose any of us were really ready for 2014. This subterranean passage we’ve wandered into, at first shocking, until it’s purpose is made clear. In 2012 this journey began, the intensity building, the blessings increasing… we all became a part of a massive shift. Everything moving preparing for birth. We’d grown accustomed to the darkness, without our knowing… in so many little ways. It crept in, till it became a part of daily living. We forgot what and who we really are. As each month passes, I’ve found myself saying ‘it’s a big time’… I’ve stopped doing that. It appears to be a continual flow. It’s a significant year, a passageway of sorts. Like a portal between worlds… a challenging crossing, both dangerous and frightening. We were given courage, to use. It seems we’re being stretched in ways we haven’t before. Events around us can overwhelm. It’s important to not allow fear. The darkness feeds off fear… and is afraid of courage. I’ve never forgotten those words from a very dear friend of mine. Courage is what the darkness fears. It could sound like a fairytale… what is the darkness? It’s the absence of Light, of clarity, of understanding… of Peace. We know what that feels like, because we feel it inside us. We’re not built for darkness, it creates much turmoil in our body. We were built for love and joy. Our body reflects what is happening to us. We need Peace more than we know. It’s the missing piece of the jigsaw, the one we look so far and wide for. It’s our greatest need. With lots of Leo and Scorpio this month, expansion and contraction… creative expression and simmering emotions. Venus and Mars challenging each other. Both Venus and Mars have returned to their natal place for me… the energy is familiar. It’s time to understand them more clearly, with Jupiter giving so generously. It’s time to make our way through… to the other side. A time for finding ‘you’. This is the time, no time will be greater, the time is now. Turning this ‘steam’ into a powerful source of energy… for transformation and growth.